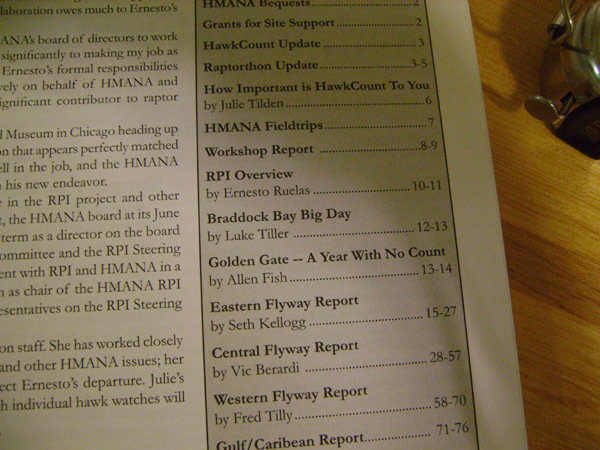 So excited that I finally got my name in print in a reputable birding journal. 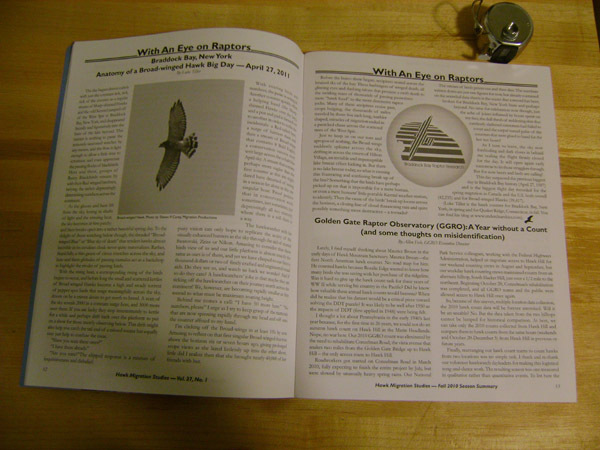 I just had a rather nice piece published in ‘Hawk Migration Studies’ Volume 37, No 1. 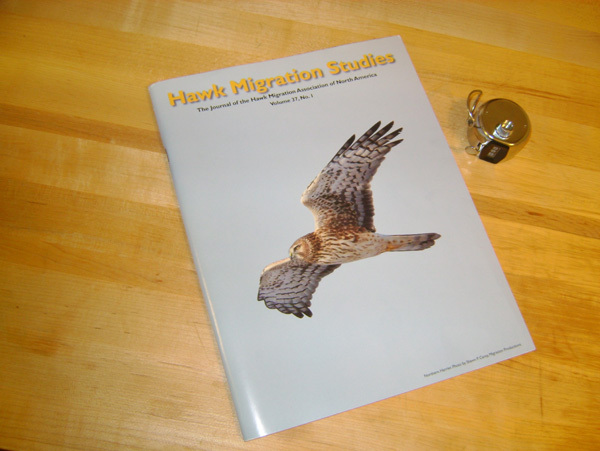 The Journal of the Hawk Migration Association of North America. Kind of a nice story as the guys at HMANA picked up the article from my blog post about the Big Day that we had at Braddock Bay this spring. I enjoy writing a lot (although finding time and inspiration for this blog isn’t always easy) so it was really nice to realize that other people liked it too, especially as those people happened to run a really cool organization. You can essentially read the article on my blog (here) but I would also encourage you to join HMANA as well. HMANA, as well as providing you with fantastic articles written by yours truly 😉 (beautifully illustrated by Shawn P. Carey’s stunning pictures), also run the hawkcount website (here) and provide cool online data such as the Raptor Population Index (here). October is their fund-raising month specifically for the Hawkcount website. If you aren’t a member of the organization and you like hawks and hawkwatching (and like to scan through their information online) you should really become a member. If you are already a member of the organization maybe you want to consider a further donation to help fund the Hawkcount website and support it’s upkeep and improvement. You can find out more about the sponsorship opportunities (here). As well as giving a shout out to HMANA I should also give a big shout out to Braddock Bay Raptor Research (website here). If I hadn’t been up at Braddock counting I would never have found the inspiration for the piece of writing. Braddock is really a miraculous place, a migration hotspot for birds of all shapes and sizes from giant Sandhill Cranes to tiny warblers. Not only is the place amazing but the people up there are too. The whole organization is run by a fantastic group of volunteers, who use their time to invest heavily in the conservation, education message and scientific research that the organization undertakes. The rewards for their labor are the pride they have instilled in the area and the excitement their programs elicit in the local public. You can keep up with their events on their facebook page (here). Next year they have big plans for an expanded educational program amongst other things and I am really looking forward to going back up there to help them with that, as well as with the count. For me the educational part of hawkwatching is one of the most important aspects of carrying out a count and I am really looking forward to getting more involved in that next year. If you want to support an excellent, small scale conservation, research and educational organization I couldn’t find one I’d rather recommend. OK I may be a little biased but you have to trust me on this one, I certainly wouldn’t say the same for every organization I’ve worked for. Very nice piece in support of two fantastic organizations – no biases here ;). Let me add that BBRR was very fortunate to have had you join our ranks last spring. Looking forward to what’s in store next season! Look forward to seeing you guys soon. Congratulations-you’ve earned it! Now I’ll go back to read the article.